Crazy technology, social media and increasingly creative and innovative minds have all contributed to the way we market and promote our businesses. However, despite the effectiveness of modern marketing tools, with everyone doing it, just how effective really are they? That’s why, with branded sweets, you can ensure that your business stands out from the crowd and is one step ahead when it comes to sweetening your success! One of the most effective ways to reach large numbers of people with promotional material is at corporate events. With free pens being given out here, there and everywhere, it might be hard to stand out, so here at Keep It Sweet we want to ensure that your business is promoted in the best possible way…with sweets! Sweet giveaways are the perfect, cheap - yet highly effective method of getting your business name out there in a unique way. Whether this is at an event, meeting, or in a shop, we have plenty of affordable and fun branded sweets to put a smile on even the fussiest of customer’s faces. One of our most popular options is Personalised Chocolate Coins. These traditional favourites are full of history and are a common stocking filler over the festive period. Reignite the excitement of Christmas with these tasty chocolate treats and associate potential customer’s and client’s happy memories with your business in order to make them feel as if they have really hit the jackpot! Choose from silver and gold coins of different sizes and we will brand them with your company logo to create truly unique and innovative personalised sweets just for you! In fact, there’s scientific research which has shown that the use of sensory marketing (marketing using sight, smell, sound, touch and taste) is highly effective as it uses the senses to relate with customers on an emotional level, meaning brands can forge emotional connections in customers’ minds to ensure they are remembered and thought highly of for years to come. 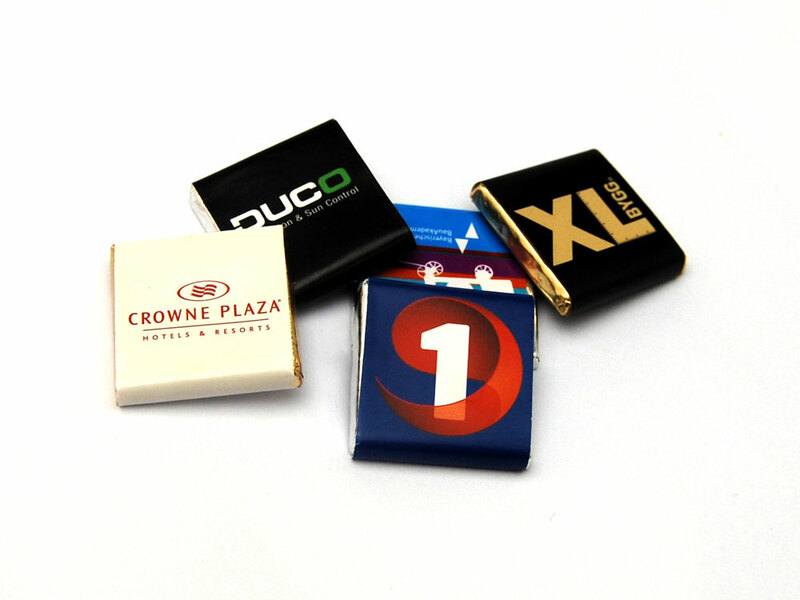 What’s more is, branded sweets are a brilliant affordable option for every business out there, no matter how large or small and with hundreds of different options and possibilities in our range, we are sure that there is a product perfect for your business. Another great product is our Branded Sweet Jars. Not only do these look great, but they are the ideal boardroom addition to impress potential clients and add a touch of excitement to a meeting. We have plenty of different themed jars to choose from, but they can also be filled with any delicious retro sweets of your choice. Choose from printed or etched glass jars or plastic jars with labels and a variety of sizes to suit every budget. Why not place on the table during a meeting for everyone to dig into and to ensure that your business sticks in their mind? Sticks of Rock or Rock Pieces are another great way to promote your business with branded confectionery. Put your own twist on this classic favourite with a company logo or message and create a delicious advertising tool! Dragees are also a great way to get your business across to customers. Made with a 70% cocoa centre and a thin crispy sugar shell, these bite-sized treats look almost too good to be eaten and are available in a wide range of different colours. These would be perfect to hand out to customers in a shop or at an event. Maintaining good relationships with other businesses is an important part of attracting new business opportunities. However, finding suitable ways to do so can prove difficult. 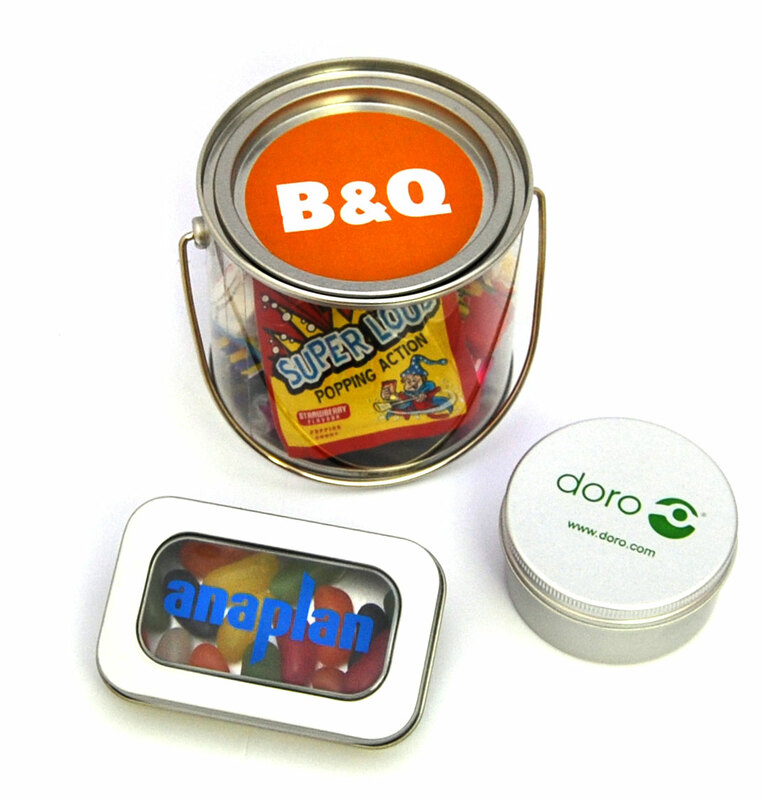 Bespoke Tins are a fun form of branded confectionery that would make a unique business gift or thank you present and is available in a variety of different shapes, from plain circular tins to car shaped tins. Plastic Moulds are another fun shaped type of branded sweets. From train shaped, to duck shaped, there are many different moulds to choose from, filled with delicious sweets of your choice that are sure to go down a treat! Whatever your business, there is branded confectionery to suit you. View our branded sweets range online today and to do not hesitate to contact us and we will be happy to help you create the perfect promotional tool.